“Abortion” and the “sanctity of human life” are terms that are thrown around a lot in American politics. Abortion activists are some of the most committed, vocal and visible activists in the United States. If you don’t believe that, drive by any Planned Parenthood at midday. But I’m not writing about women’s rights and abortion today. What I am taking aim at is the minimum wage. The minimum wage has lost a portion of its purchasing power since peaking in the late 1960’s. Had the minimum wage kept up with inflation, it would be around $10 or $11 per hour. Not only has the purchasing power of minimum wage decreased, the productivity of minimum wage earners has gone up exponentially since 1960. The issues revolving around technology, productivity, exploitation and economic inequality, however, is an issue for another day. We are currently having a heated debate about raising the minimum wage, with some workers pushing for a minimum wage of $15 per hour. Critics argue that increasing the wage would kill jobs, increase automation, and reward people for failing to get an education or learning a skill. 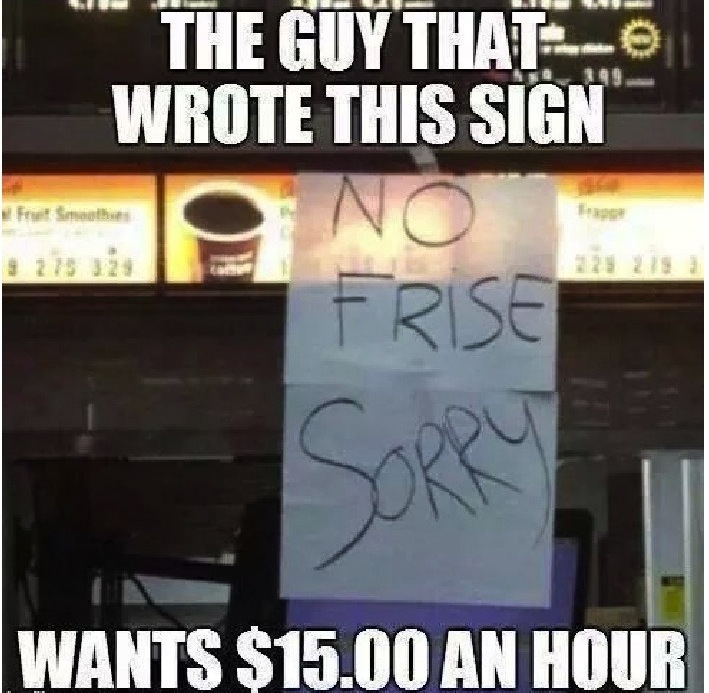 A meme is currently making the rounds on Facebook depicting a misspelled, handwritten sign on the menu at a McDonald’s that reads, “No frise, sorry.” “Pay them $15 an hour?” the Facebook user states indignantly. And the “likes” pile up; surely we are all better than those ignorant fast food workers. So, does a failure to spell correctly mean a person should live in poverty? Again, this is not the question I seek to answer today. The issue I want to address today is the issue of time, life and value. When a person works, they are essentially exchanging their time for money. A main argument against raising the wage is that people who earn minimum wage are low skilled or uneducated, so they do not deserve to make a decent amount of money. However, the fact that minimum wage workers are generally paid per hour, rather than tasks performed or skills used, means that the workers are exchanging their time for money, not their skills. And what is a person’s time but pieces of his or her life? Let’s address this idea further. Critics of abortion argue that human life is sacred, and that we should cherish life. However, this is generally the same crowd who argues that minimum wage should stay where it is, or be removed altogether, allowing markets to determine what a person’s time is worth. In my view, this is a fundamental contradiction: human life is sacred and valuable, except in the case of fast food workers? If life is indeed sacred and valuable, should we not seek to pay people a minimum amount worthy of that intrinsically valuable life? Some argue that the minimum wage should be abolished altogether, and some states do not even have one and instead fall back on whatever minimum is set by the federal government. When we abolished slavery, we decided that people should be compensated for their time and life. However, today many argue that people are only worth what their bosses are willing to pay them. I feel as though the conversation about the minimum wage is flawed and misguided. The arguments currently revolve around skills, incentives and unintended economic consequences. If we truly are a nation that believes in people and their innate value, shouldn’t the value of their time, and therefore their life, be a consideration? A person who works a full-time job over the course of fifty years spends about 104,000 hours at that job, or near a full twelve straight years on the job. So then, if the average lifespan is around seventy-five years, and we spend one-third of our lives asleep, that twelve years spent at work is a significant portion of the time we spend on this planet. Should we not guarantee a decent wage in exchange for that valuable time that we give to employers, regardless of the skills we know or the education we received? Is the life of a middle class person worth more than a single mother working a minimum wage job? Is the life of a wealthy hedge-fund manager worth more than yours? The answer to these questions, if you truly believe in the value of life, is no. I would argue that a truly moral society would guarantee a decent minimum wage in exchange for a person’s valuable, limited and unrecoverable time. Kevin Nugent is an Oriskany, NY native who is currently teaching English with his wife in South Korea. Before that, Kevin sat on the Board of Directors for Central New York Citizens in Action, Inc. and was an adjunct professor of Government and Politics at Utica College.